The discovery of Bart Erhman’s books has made a major impact on my life. I only wish that I had discovered and read them all sooner. As a former fundamentalist, I find his evidences compelling and his assertions solidly based on those evidences. While I am still a believer, Erhman is Agnostic. As a result, there are many conservative Christians that discount his works on the basis of his belief instead of trying to refute his facts and sources that provide evidence to what he affirms about the inerrancy and inspiration of scripture. However, it does not take scholarship to find the discrepancies, errors and mistranslations that the Bible contains. It only takes study – as many of these errors are obvious – and a concordance. This said, I do quote Erhman a lot on my blog and in my articles. I consider him one of my top two favorite scholars of all time. Because of this, there are fundamentalists that discount my articles and the evidences I quote because they discount Erhman’s expertise and scholarship based on his beliefs. To me, this makes about as much sense as discounting a person’s works based on their gender; which many fundamentalists also do! Since there are fundamentalists that believe that Erhman is anti-Christian by assumption, I wanted to let everyone hear directly from Erhman regarding what he believes about himself and his view of Christianity and the Bible. I don’t consider myself anti-Christian. When I tell people this, I often get a disbelieving response: of course you’re anti-Christian. Look at all the ways you attack Christianity! In my view, the only thing I attack in my writings (and not even directly) is a fundamentalist and conservative evangelical understanding of Christianity. But to say for that reason that I attack Christianity is like saying that if you don’t like raspberry sherbet you don’t like any kind of ice cream. . . I certainly do not mean to say that I consider myself either a Christian or an apologist for Christian causes. I am neither. But in my writings I have never attacked Christianity itself. I have attacked a particular flavor of it. It is true that in my part of the world, the American South, the flavor I have attacked happens to be the flavor preferred by the majority of practicing Christians. But in a historical and worldwide perspective, highly conservative Protestant Christianity, whether fundamentalism or hard-core evangelicalism, is a minority voice. It is the voice that says that the Bible is the inerrant Word of God, with no contradictions, discrepancies, or mistakes of any kind. I simply don’t think this is true. And neither have most Christians over the course of history. . . But I personally love the Bible. I read it all the time, in the original Greek and Hebrew; I study it; I teach it. I have done so for over thirty-five years. And I don’t plan to stop any time soon. But I don’t think the Bible is perfect. Far from it. The Bible is filled with a multitude of voices, and these voices are often at odds with one another, contradicting one another in minute details and in major issues involving such basic views as what God is like, who the people of God are, why there is suffering in the world, how we are to behave, and on and on. And I heartily disagree with the views of most of the biblical authors on one point or another. Still, in my judgment all of these voices are valuable and they should all be listened to. Some of the writers of the Bible were religious geniuses, and just as we listen to other geniuses of our tradition—Mozart and Beethoven, Shakespeare and Dickens—so we ought to listen to the authors of the Bible. But they were not inspired by God, in my opinion, any more than any other genius is. And they contradict each other all over the map. Even though there are innumerable historical problems in the New Testament, they are not of the scope or character to call seriously into doubt the existence of Jesus. He certainly lived, and in my view he too was a kind of religious genius, even more than the later authors who wrote about him. At the same time, he probably was not well educated. He may have been only semiliterate. But he certainly lived, and his teachings have impacted the world ever since. Surely that is one gauge of genius. Since that is the view I am sketching in this book, I can imagine readers who think me anti-Christian taking umbrage at my refusal to tow their line. And Christian readers may well be pleased to see that even someone like me agrees with them on key points (although they certainly won’t like other things I have to say in the book). My goal, however, is neither to please nor to offend. It is to pursue a historical question with all the rigor that it deserves and requires and in doing so to show that there really was a historical Jesus and that we can say certain things about him. 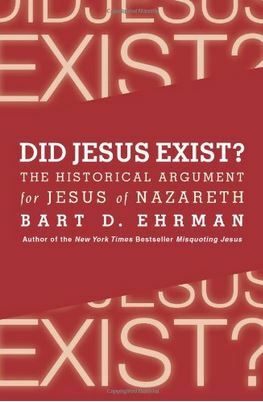 – Bart D. Erhman, Did Jesus Exist?, pgs. 36-37. Maybe I should point out that I do not see it as my mission in life to convince other people to agree with me on this issue. I’m always happy to talk with people about their beliefs, honestly and openly, and to share with them why I no longer can believe. I don’t think they are lacking in intelligence for believing (my wife is far more intelligent than I, and she’s a believer), and I don’t think that I’m evil for not believing. What we need in religious discussion is a frank and brutally honest sharing of views, not simply an insistence that everyone comes to believe, or disbelieve, what we do.—Erhman, Misquoting Jesus, pgs. 248-249. Now, let me throw out some seeds for thought on inerrancy and inspiration of scripture. First of all, I would think that what God inspires should be PERFECT, because God is PERFECT. Whatever the Holy Spirit of God inspires will be without contradiction and error. Yet, the Bible is full of contradictions and errors! Think about this. Does one think a PERFECT God will produce an IMPERFECT product riddled with imperfections that could lead to wrong beliefs? What about a product that would lead to abusive attitudes and behaviors toward women and children? Does the Bible contain truths? I believe so. Do these errors mean that we should discount the known truths because of the errors? I don’t believe so. These errors and contradictions show the humanity of the authors. They were not perfect human beings and therefore, they could not produce a perfect work. If these authors were inspired by God, then their works would be perfect because God is perfect. However, if they were inspired like any other writer is inspired, then one will find mistakes. There is a difference between these two types of inspiration, wouldn’t you think? One more area of thought I would like to mention is that many Christians discount known facts based on what they are taught instead of research and evidence. Also, what about the known errors, changes, insertions and deletions that the translators made to the manuscripts in order to lean the scriptures toward their already biased views? Scholars have known for centuries about these changes and biases. So, does one discount the inerrancy and inspiration based on the mistakes and changes (known facts), or, does one adhere to its inerrancy and inspiration based on the opinions of preachers and Bible theologians of the 20th century that made these claims that, heretofore, were not made? What discovery transpired during the 20th century with all the manuscripts in existence that suddenly moved conservative Christians to propound that the Bible was inerrant and inspired? If nothing transpired with the manuscripts, then could it have been a dispute that happened because different factions disagreed on a theological doctrine? If it is not based on facts, then one would think that it would be foolish to make such a presumption that for centuries had not been made or even considered. I believe it happened as a result of a dispute between religious factions. These are just some of my thoughts on this subject as I continue to study and learn. But more importantly, I wanted readers to know that Erhman is not anti-Christian. Instead of making assumptions and discrediting his work based on his belief, wouldn’t it be better to make an informed decision based on evidences and facts? Of course it would! That’s what Erhman does. If everyone would do this, it would prevent a lifetime of living, believing and propagating lies. As a result of the lies that many fundamentalists proclaim as truth, lives are being destroyed; as many of these teachings lead to abusive attitudes and behaviors toward women and children. The stories on my blog are a testament to this fact. My desire is that everyone would do their due diligence to search out if what they have been taught is true using outside sources instead of biased sources from within their own sects. The truth is that getting an unbiased education will prevent much of the animosity and conflict that proliferates throughout Christianity against those that believe differently or disagree. It also allows for sound reasoning between different belief systems without the anger and vitriol being spewed. Study. Find evidence that supports the truth of a matter. Think on it. Make decisions regarding it. Don’t believe blindly what you are told is truth. This entry was posted in Religion's Cell Articles and tagged Bart D Erhman, Bart Erhman, Is Bart Erhman anti-christian? on November 4, 2013 by Religion's Cell.